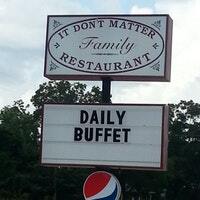 While driving through the south, we saw a sign for a restaurant that was called “It Don’t Matter”. It didn’t take long to figure out the purpose for this strange name. Often times when we are out with family or friends, trying to decide where to eat, someone will invariably say, “It don’t matter”. (Please pardon the poor grammar!) What they mean is they really don’t care where they eat; anything would be OK. The restaurant with the catchy name is trying to get some business by literally being the place that is mentioned. When it comes to eating out, most of the time it really doesn’t matter where you choose to go. Any place is fine with most people. However, there are some decisions in life that do matter. They matter very much. In fact, when it comes to what you believe about God, Jesus and the Bible—those decisions are critical! “…I have set before you life and death, blessings and curses. Now choose life, so that you and your children may live and that you may love the Lord your God, listen to his voice, and hold fast to him…”—Deuteronomy 30:19-20. This entry was posted in Christian Living, Communion Meditations, Humor and tagged choices, choose life, decisions, illustration, It Don't Matter restaurant, love the Lord your God, obedience to God. Bookmark the permalink.